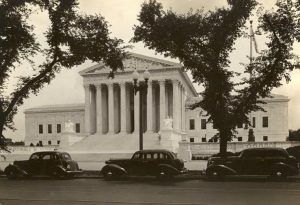 On this day in 1935, the Supreme Court moved into its current home on First Street in Washington, D.C.
“After years of moving about and occupying ‘borrowed’ quarters,” read one news account of the day, “the Supreme Court at last has a home of its own—a home which reflects the dignity and prestige of the nation’s highest judicial body.” “Neglected High Court Rises to Magnificence,” ran the headline in the Washington Post. The completion of the new home for the Court was largely the work of William Howard Taft, the ex-president who was appointed Chief Justice in 1921. From the time he arrived on the Court, Taft lobbied Congress for new chambers. In its early years, the location of the Supreme Court had bounced around before settling into a room in the basement of the Capitol (interrupted for a time after French troops set fire to their chambers, along with much of the rest of the Capitol building, during the War of 1812) and then, beginning in 1860, to new chambers upstairs in the Capitol, where the Court remained until 1935. But Taft felt the facilities inadequate. There was little work space for the justices, so most of them worked out of their home offices. Even before Congress had approved a relocation plan, Taft privately reached out to the famous New York architect Cass Gilbert to design the new building. In 1928, Congress created a building commission for the new Court, with Taft as its chair. The following year Congress apportioned $9.7 million to construct the new Supreme Court across the street from the Capitol. Taft’s instructions to Gilbert were that the building be “enduring and easy to keep clean.” In preparing to design the new Supreme Court, Gilbert traveled to Athens, where he studied the Parthenon. Taft saw ground broken on the new Court building in early 1930, but he died that spring, soon after he stepped down from the Court. Construction ran through the spring of 1935. For more on the Supreme Court building, check out the descriptions on the official Supreme Court website or take the Oyez virtual tour. This post was written by ISCOTUS co-director Christopher Schmidt, with research assistance by ISCOTUS Fellow Michael Halpin, Chicago-Kent Class of 2020, and editorial assistance by ISCOTUS Fellow Bridget Flynn, Chicago-Kent Class of 2019 .